Attend a beautiful gala at the Smithsonian Craft Show Preview Night at the National Building Museum. Meet the artists and shop for unique handcrafted pieces in a fun, intimate setting with a cocktail buffet. Be the first to see and buy featured fine crafts! The 2019 Smithsonian Visionary Award will be presented to Joyce J. Scott by the Secretary of the Smithsonian at the 37th Annual Smithsonian Craft Show Preview Night Benefit. Meet artists juried into the 2019 Smithsonian Craft Show. Enjoy first-choice shopping, sip a cocktail and savor a buffet. Shop in an intimate atmosphere and see the exhibitors’ works before public viewing. Receive a general admission ticket to return to the show during regular Craft Show hours. 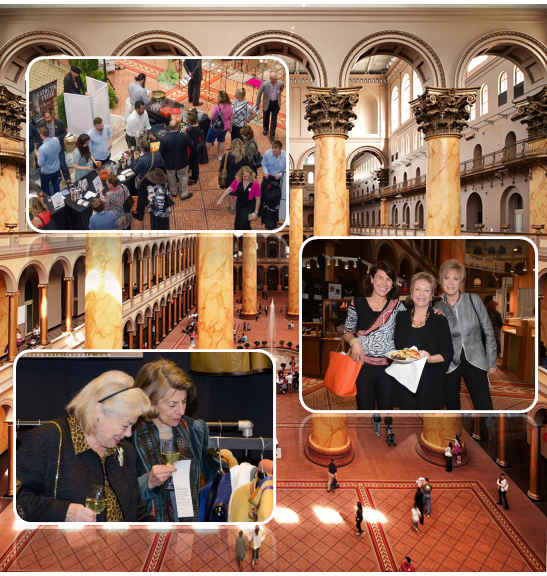 The Smithsonian Craft Show is organized and presented by the Smithsonian Women’s Committee and raises funds to support Smithsonian projects that open knowledge, adventure, and discovery to the world. Over the years, the SWC has awarded over $12 million in grants to the Smithsonian’s 19 museums and libraries, 9 research facilities, traveling exhibits, and the National Zoo. Three jurors expertly selected this exciting group of artists from a nationwide applicant pool. This year’s show features the very best in baskets, ceramics, fiber, furniture, glass, jewelry, leather, metal, mixed media, paper, wearable art, and wood. All work is for sale.